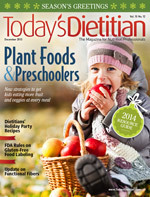 Learn new strategies to get kids eating more plant foods at every meal—even at snack time. Clients can eat, drink, and be healthy during this festive season as they serve appetizers, side dishes, and desserts that contain less fat, sugar, and sodium than the traditional versions. Research shows they provide similar health benefits as intact fibers in whole foods. A useful tool for some patients to improve blood glucose control. Celebrate the holidays as you shop for products and services you can use in your daily practice. 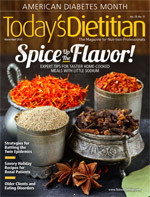 Experts offer tips for preparing tastier home-cooked meals with little sodium to help clients prevent chronic disease. The medical community is working hard to find solutions to the diabetes and obesity crises, and RDs play an important role. Food Network Chef Aaron McCargo Jr has developed bold and flavorful dishes for patients with kidney disease. Here, he shares five creations so your patients won’t have to worry about dietary restrictions this holiday season. Incorporating simple techniques during sessions will help spur clients to success. With the increasing prevalence of eating disorders among older adults, it’s important to recognize the symptoms and learn how to help care for these aging patients. Learn how to avoid them and the foodborne illnesses they cause. 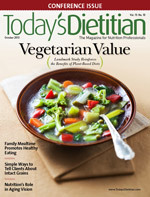 The Adventist Health Study-2 has revealed new discoveries about vegetarian diets. Today’s Dietitian reports on the current results. Research shows children and adolescents who regularly eat with their families are more likely to develop healthful eating habits that last a lifetime. Nutritious snacks that fit into your clients’ calorie needs may control weight and improve overall health. Learn about the role certain foods and nutrients play in preventing and slowing the progression of this sight-threatening disease. As the popularity of these products rise, so do concerns about their hazards. This year, the Academy of Nutrition and Dietetics Food & Nutrition Conference & Expo is being held in this eastern Texas city. We asked local food experts about the best places to eat for our annual guide. Supermarket shelves are brimming with new probiotic products. Learn more about what’s on the market and how to counsel clients and patients on what to buy and what to leave on the shelves. Learn about what they are, what causes them, and the associated symptoms. Tech-savvy RDs discuss the challenges, successes, and gumption it takes to create a mobile app that can build your business and further your career. These sandwich and cracker spreads boast abundant nutrients that can reduce cardiovascular and other chronic disease risks. 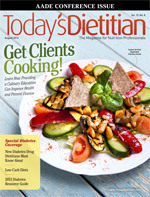 Dietitians are in the perfect position to help inspire people to don their aprons and get cookin’! All it takes is some creative efforts in culinary education. Learn about a new diabetes drug that targets the kidney to improve glucose control in adults with type 2 diabetes. Weight loss in obese elder patients can be detrimental to their health, but dietitians can help them lose weight appropriately and healthfully to improve their quality of life. RDs can empower women to cut their risk and manage the disease to prevent harm to mother and baby. Check out this sampling of products and services available for your clients and patients managing diabetes. Six of the country’s top quick-service chains continue to introduce more healthful menu items to meet the demands of health-conscious consumers. Remind clients that breakfast can provide vital nutrients and even aid in weight loss. The Organic Foods Debate — Are They Healthier Than Conventional? Many consumers believe organics are healthier than conventional options, with more nutrients and significantly less pesticide residues. Various eateries are serving tasty, authentic, gluten-free cuisine to meet the needs of gluten-sensitive customers. Five RD/DTR teams in various specialties demonstrate how these nutrition professionals work in harmony to make a profound difference in patients’ lives. Research suggests a nutrient-rich diet plus exercise may prevent and even reverse this condition. 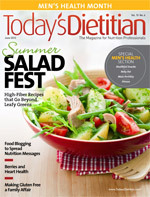 Recommend clients try tasty, high-fiber salads that will help them lose weight more effectively—and keep it off. Food and nutrition blogging is a great way to reach the masses, build your brand, and market your services. Here are insider tips on how to begin and become successful. Here we highlight some creative ideas and recipes male clients will enjoy. 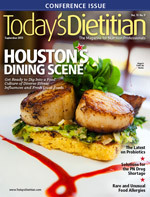 Dietitians discuss the health consequences and interventions that can hit home with male patients. Research suggests a nutrient-dense diet may play an integral role. 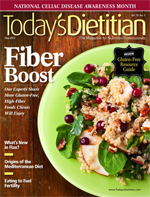 Many celiac disease patients don’t get enough fiber in their diets. Experts share strategies clients can use to help increase their intake. Experience this traditional, healthful eating pattern from the rustic, windswept island of Pantelleria in the Sicilian region of Italy. This excerpt from dietitian Bridget Swinney’s book Eating Expectantly can be used as a patient education resource to help clients and their spouses address their fertility issues. Learn more about their potential to lower the risk of cardiovascular disease, hypertension, cancer, type 2 diabetes, and obesity. 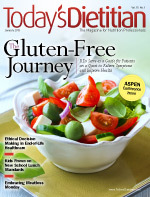 Check out our annual listing of products that may help your clients and patients following a gluten-free diet. Emerging research suggests certain bacterial strains may play a role in treating and managing inflammatory bowel disease. Dietary intake of just the right amount of omega-6 and omega-3 fatty acids is crucial for optimal health. Learn more about these fats and strategies to better counsel patients. 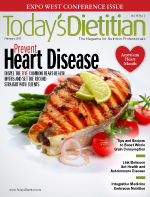 Today’s Dietitian discusses this hot topic with some of the world’s leading dietary antioxidant researchers. 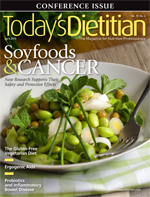 Research suggests dietary interventions may help prevent and lessen symptom severity. Evidence shows high-quality proteins, such as milk proteins, promote satiety, weight maintenance, muscle synthesis, and blood glucose control. Here’s our fourth annual showcase of 10 incredible RDs who are making a difference. Studies show this concept can help clients lose weight and better manage chronic disease. Research shows these diseases are interrelated as well as the strategies to prevent and manage them. This article helps to dispel five common heart-health myths and set the record straight with clients. Research suggests digestive abnormalities may be the underlying cause of autoimmune conditions. 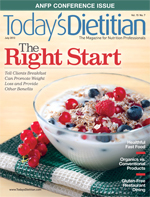 Since nutrition plays a critical role in keeping bones healthy and strong, Today’s Dietitian offers strategies to dietitians to help clients power up on bone-friendly foods and nutrients. Studies show this therapy can improve glycemic control in patients with type 1 and insulin-requiring type 2 diabetes. RDs serve as a guide for patients on a lifelong quest to relieve symptoms and improve health. 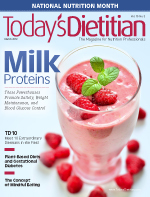 This article details the dietitian’s role in end-of-life healthcare when considering enteral and parenteral nutrition. Research suggests good nutrition may help manage various symptoms.